For me, it was love at first sight. From the moment I first saw it I knew I had to have it. Its bold and exotic appearance, unique personality and understated charm are just a few of the things I adore about the Louis Vuitton Kimono Monogram Canvas bag. Inspired by one of the most intriguing symbols from the land of the rising sun, this purse is a tribute to the traditional Japanese robe. Its design is an echo for simplistic beauty and everlasting elegance. It is a very unique LV handbag that knows how to get the right attention in every crowd. The LV Kimono is an intriguingly graphic tote that steals the show with a magnetic combination of Monogram canvas and fine calf leather. But its design is so much more than just a nice balance of contrasting materials. Its design is captivating because it blends two very powerful motifs. One is the V-signature logo that has its origins in a classic Louis Vuitton advertisement from the ’65s and the other is the Japanese Kimono robe, a cultural symbol that emphasizes beauty and elegance. I think that by now you already got the idea. I really adore this bag. And since I am absolutely crazy about its unique design, I was looking forward to buying it. After months of wait, research and deciding my new and amazing Louis Vuitton Monogram Kimono Monogram Canvas replica handbag is finally here. And it is everything I expected it to be- stunning, beautiful and last, but not least, imposing. Below you will find all my thoughts about this striking LV fake bag. My Louis Vuitton Kimono replica is loyal to the original sizes of the authentic bag as it measures 16.5 x 17 x 5.7 inches (length x height x width). LV makes it in only one size which could be considered medium. It is not very big, but it is not small either. It is just right for carrying it every day to work, shopping or to social events. You can also put a lot of things inside. Due to its generous proportions, the purse is quite spacious and practical. Plus, its carefully studied construction allows ideal weight distribution so that it feels lighter when it’s full. 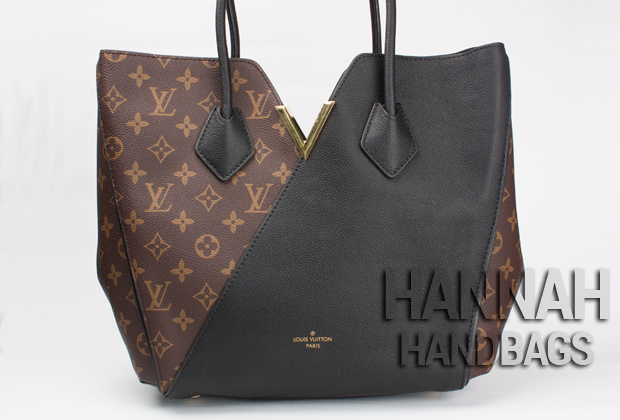 Just like the authentic one, the LV Kimono fake bag is manufactured from Monogram canvas and high quality calf leather. I was really impressed with the materials used to make this bag as these are quite good and superior to what is used on most replicas. When you touch and hold the bag it feels very authentic and sturdy. The leather and the canvas are quite thick and stiff allowing the purse to stand tall and not make unflattering creases. Given the fact that this is a very graphic purse, I think that this aspect is very important. Another thing that tells you that this is a very good replica is the fact that it actually has that nice smell of real leather. It doesn’t have the strong chemical odor that some poor quality replicas have. The handles on a bag are a really big deal. You simply cannot ignore this when you are buying a knockoff as badly crafted handles can ruin what, at first sight, may seem like a nice imitation. 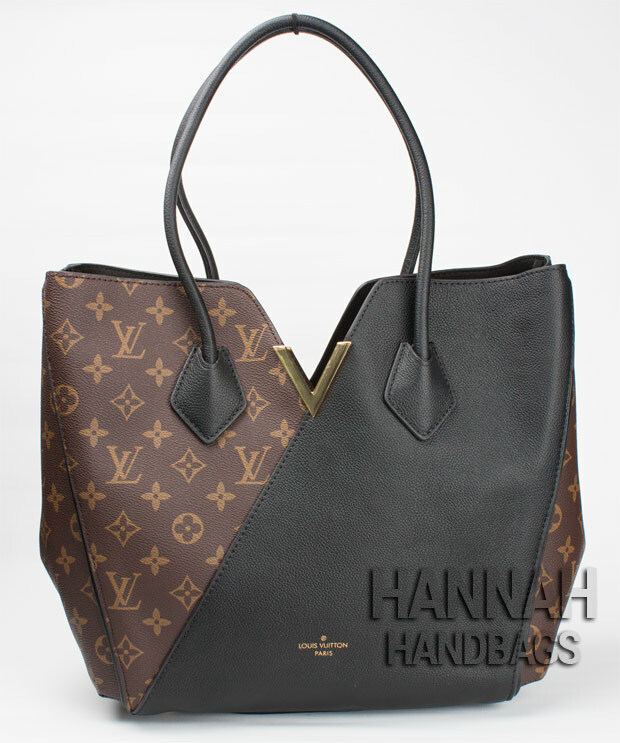 The Louis Vuitton Monogram Canvas comes with elegant Toron leather handles that are quite tall and beautifully arched. This style of handles is also rounded and features very discrete stitches on the inside. I was very impressed to notice that my fake purse has the same type of handles. Crafted from fine black leather, these are also impeccably stitched and rounded so that it offers maximum comfort when carried on your arm. Also, these are attached to the body of the bag by using an arrow-like shaped leather patch on each end of the handles. When comparing the photos of the genuine bag with my replica I noticed that these leather patches are applied on the same exact place as on the original bag so that it identically aligns with the LV flowers printed on the Monogram canvas. Louis Vuitton makes the Kimono tote in three colors Aurore, Cerise and Noir. The brand has also produced some limited edition models such as the Kimono Limited Edition Cruise 2017, but the most iconic and popular color versions continue to be the pink, red and black ones. My favorite is the black LV Kimono, obviously. I think this color is the one that captures best the intriguing and elegant personality of the bag. Plus, it is easier to style up with your wardrobe. The design is already intricate and pretentious. Adding a bright color like red or pink only makes it harder to match it with your clothing and shoes. So for me, the right color for this bag is black. No doubt about it. The design of the Louis Vuitton Kimono is eye catching as LV also admits on its website, but by combining a unique and very interesting design with a resonating elegance, the brand has created a splendid product. The body of the purse concentrates a few stunning details. The upper side is a modern representation of the traditional Japanese robe with its distinctive V neckline. The V cut of the bag is emphasized by the addition of a golden V hardware that is beautifully polished. This metallic V is applied only on the front side of the bag. On the other side there is only the stitching on the margins. Then the actual body of the bag is wider on the top and narrower on the bottom. The dual personality of the bag is given by asymmetrically combining the iconic Monogram canvas and black leather as to form a “wrap over” effect reminiscent to the traditional Japanese Kimono robe. 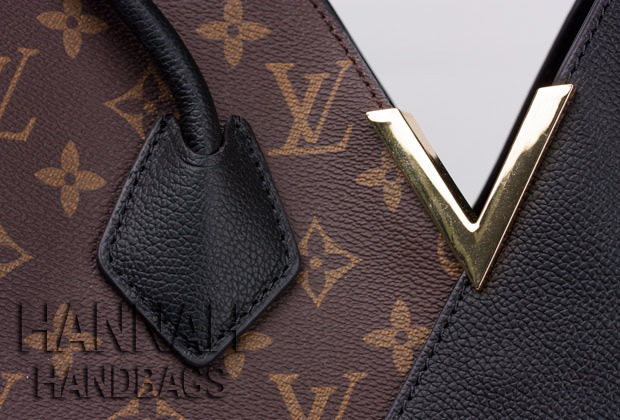 The left part of the LV Kimono’s front side is made from Monogram canvas, smaller and triangular shaped whereas the right part is black, larger and trapezoidal shaped. The sides feature the Monogram print and have a vertical tall folding that creates a beautiful full and rounded look. The base of the bag is squared shaped with impeccable stitching across its 4 sides. I was quite pleased to see that my replica has the same sturdy and hard base as the original purse. Because it was manufactured from superior leather, the bottom of the purse is stiff enough as to offer excellent robustness and allow you to carry heavy stuff without compromising its beautifully defined shape. There are also 4 rounded metallic studs applied on the base of the purse. These have the “Louis Vuitton” name engraved on them. 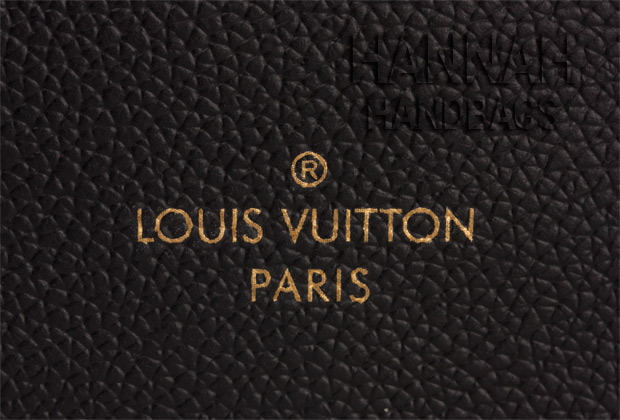 The inside of the Louis Vuitton Kimono Black Monogram is made from black microfiber lining which many people consider to be better than lambskin or suede because it is easier to maintain. This material is very soft and supple, plus it has a very elegant look. The authentic Kimono tote has the same type of lining and it was probably preferred to the other alternatives because it is lighter and slimmer thus allowing the bag to feel more delicate and feminine, just like an actual Japanese Kimono robe. The purse doesn’t have a top zipper closure. LV preferred to keep things simple and relaxed with this one and it used a transversal snap hook as a closing system. This offers extra versatility and maximum access to the content of the bag. When you need something quick you just grab it, no need to waste time unzipping the purse every time. At the inside of the Louis Vuitton Kimono purse we find a middle zip compartment that is stitched to the sides of the bag and is non-removable. This middle compartment is rather wide and flat. It can fit things like IDs, cards and phones, but not very bulky items. On one side of this compartment there is a black squared leather tab embossed with “Louis Vuitton Paris Made in France” wording written on 3 rows and in gold color. The purse comes with gold hardware that has been very nicely polished. I like very much the elegant shine of the gold parts used on the Kimono tote and I think that it is an excellent choice for augmenting the elegant personality of the bag. 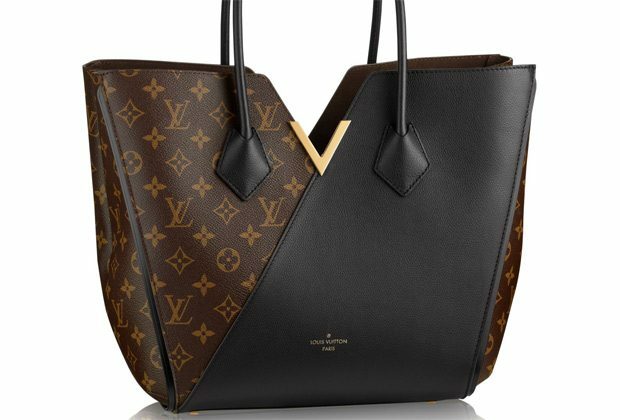 To match the hardware, the “Louis Vuitton Paris” embossed wording on the lower part of the front side of the bag is also in gold color. I really have to say that this Louis Vuitton replica handbag enjoys flawless stitching. 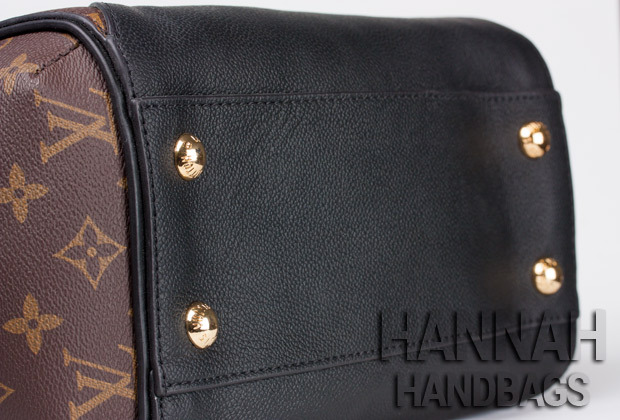 Just like on the genuine purse, it has black stitching both on the inside and outside. And surprisingly enough, the stitching is very well made. 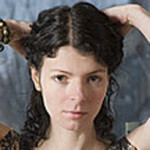 It is discrete, even and symmetric without any loose threads, discolorations or any other imperfections. The Louis Vuitton Kimono is a work bag and as all work bags it needs to be practical, functional and easy to carry around. Luckily, the purse is pretty lightweight so you can put quite a lot inside and carry it around without weight related difficulties. Another plus are the rolled handles that make it very comfortable to carry on your arm or shoulder. Also, due to the middle inside compartment you can’t put very bulky things inside, but it still is has a lot of room for all your essential work stuff. This LV purse does not come cheap at all. To be more exact, the original one costs $3,000. That is a lot for the average working gal. Even though I like beautiful things and appreciate fashionable brand products, I could never afford or be able to save that much for a bag. Instead, I prefer to buy good quality imitations like this Kimono knockoff that only costed me a couple hundred dollars. I am very happy with the way it looks and feels. Overall, it was a very inspired purchase and I recommend it to all of those who like the unique and bold design of the Louis Vuitton Kimono Monogram Canvas. 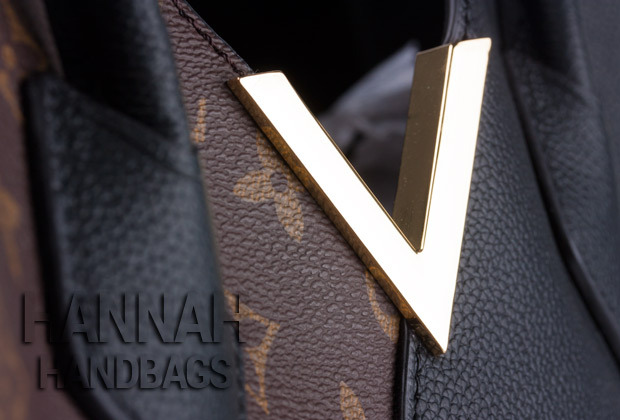 Have you purchased or reviewed any of the LV bags in which the leather should oxidize? If so, does it or does it have the very bright fake appearance? Very curious to know. Thank you so much! Just receives the LV Kimono bag. As you say, for the price, it can’t be beat (and I got mine on sale). Only thing I would suggest is to your regulars, is to make sure you send the WU control number right away to BV. I assumed WU would alert them, so after 3 wks I emailed, asking what happened and they said they were awaiting payment. I sent them the control number and it was smooth sailing after thar, DHL even called and left A Message with all the details, contact info etc. The only thing I didn’t like was it came in a bag and not in a box. I put it on a hanger to shape it. The monogram seemed a little dull, so I put some baby oil on it and it shined just like my real LV. Thanks to you I will be buying more replicas from BV. On another note, do you or your regulars know where to get a rep YSL Kate chain envelope bag? Do you still trust Vista Bags as an on-line replica bag seller? I want to get a nice bag, not have my credit card hacked, and know I will actually get the merchandise. Hey Krista, Yes I do. Actually I’ve bought a new bag from them on Halloween. Hi Dora, Have you asked the seller to send you more pictures of this purse? Anybody tried purchasing from luxurytasticrep.com before? Are they legit? Is your replica from this same manufacturer as in the review post and the same dimensions? If so, am very interested. is your kimono purse still for sale? They have also videos on youtube and instagram. Hey Lena, They have a huge collection and bags pictures look really nice, but the prices are very expensive. On guarantee page, they talk about refunds, but on return policy page it’s not clear in what case refund is issued, so you should confirm this with them. Hi Hannah, I’d like to buy a Chanel deauville tote- are you able to advise on this? Hey Norma, I don’t sell replica handbags. I review them. I want to buy this exact bag kimono replica. Where could I get the bag shown in this picture? Hey Laurie, I’ve got it from this store. But you can not see detail images online. bagsvista has 10 days return policy which is not good, most other sellers offer a longer time guarantee. I didn’t find the security guarantees on their website, if the package was seized by destination country, who will cover the lost? you’d better check it out before you pay. After checking the images, we can say it’s not from the top quality factory, and their price is too good to be true. This item is $159.00 only. You can have a try and share your story here. Maybe their items are not bad. Ho, whee i can buy a top replica with not expensive costs? How long did it take for you to receive the bag from bags vista? Hey Britt, About 10 days. Hi Hanna. After I read your reviews I decided to give a shot. They got my money a week ago and told me I’ll receive my tracking number. Since nothing. Should j be worried or it’s normal? Hey Marie, Please give me your order ID and I will contact their support on your behalf. Hey Susan, I bought it from this store for $249. Which store did you get this bag? Hey Joy, I’ve got it from this store.